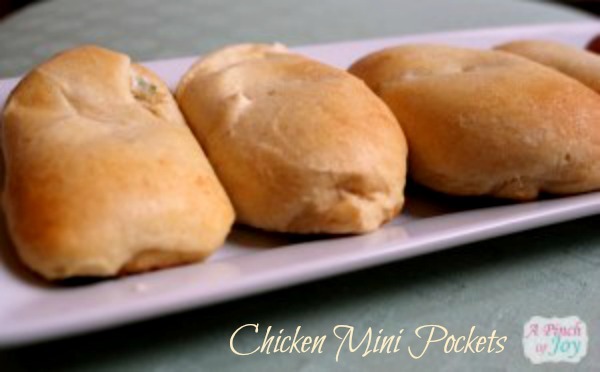 Chicken Mini Pockets –mighty good, but where did THAT name come from? Calzone is Italian and means trousers or stockings. It begins with a good sized circle of pizza dough. One half is piled with pizza type ingredients and the other half is folded over and the two open edges are crimped together to form a semicircle. Panzerotti are smaller versions of calzones. Stromboli, according to Wikipedia, was invented in 1950 in a restaurant outside Philly. It was named for the movie, Stromboli starring Ingrid Bergman. It, too, has a bread or pizza crust, but is formed into a log with cheese and ham, or other pizza type filling, before baking. A pastie (pronounced Paaa’ stee, like a sheep’s baaa) was first baked in Cornwall and brought to the US by miners who ate them standing up for lunch. It is a savory meat and cheese mixture baked in a crust, with edges turned up as they are sealed together. A turnover is also English and is a small pastry with one half of the round crust under the filling and the other half folded over, making the top. Empanada is Spanish for “bake in pastry” and is a one serving savory cheese and meat mixture baked in crust, turnover style. They are found in Latin America, Spain and Portugal. A samosa is a snack of triangular dough folded around a savory meat or vegetable filling, deep fried or baked. It is found in India and Pakistan as well as many areas in Africa and the Mediterranean. International convenience food, anyone? Whatever name you use for these morsels, they are tasty and filling! Pockets are an American/Canadian word invention, although hardly original, that describes savory meat, cheese, vegetables baked in a crust. And these pockets are small – hence the mini. So given all the alternatives – I made Chicken Mini Pockets after wandering around the globe in search of a name. Deliciously creamy bites of chicken in a flaky crust. Mix cream cheese, butter, chicken, green onion, salt and pepper till smooth. Unroll crescent dough and separate. For each triangle, fold the top point downward along the triangle edge and “moosh” the dough into a rough square. Spoon one heaping tablespoon of chicken mixture into center of dough square. Fold edges toward center and seal together. Place each filled square on ungreased baking sheet with edges downward. Bake 10-14 minutes until golden brown. Cool slightly to let flavor develop before serving. Each crescent roll has 11 carbs, cream cheese less than 1 for a total of 12 carbs/serving. Thanks so much for the feature last week! Delighted and honored! Thanks for stopping by! Quick and easy — promise! Remember this when dealing with leftovers at Thanksgiving. Great change for those turkey leftovers. I like to use 3 parts diced turkey, 1 part ham for a little more flavor than just the turkey and throw a slice of cheese in also. Don’t know how bad that makes your carb counts. Kids love them and so do their friends. Will have to give this a try with cream cheese. Sounds good. What a great idea for Thanksgiving leftovers! Meat and cheese have no carb count. Some varieties of cheese will have a little – but generally less than 1 carb per serving so is not calculated on most carb count eating plans. You can add them in any combination that suits your fancy. Thanks for stopping by!